If any holiday is made for not one but TWO blogfests, it's Halloween! 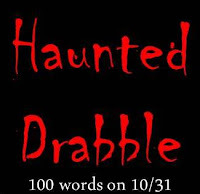 First up is Tara Tyler's Haunted Drabble. You can enter your own 100 word spooky story by leaving a link to your post in a comment at Tara's. This wasn’t like the books. He didn’t sparkle in the sunlight. He told her he loved her—that part of the fable was true—but he was lying. All tenderness ended the moment she entered his chamber; her screams weren’t those of the ecstasy she’d anticipated. Hours later, the click of approaching boots indicated his return. She gripped the splintered post in her cuffed, but now free hands, praying Meyers was also wrong about the effect of a stake through a vampire’s heart. Today is also the super-exciting launch of Elizabeth Mueller's novel, Darkspell, and she's hosting a Spookafest, in which we reveal what we'd do if we had all the magic in the world. My first order of business would be to parse up the magical abilities and bequeath them to others I trust to use them responsibly. We'd form our own Order of the Phoenix/Justice League type of thing to fight evil. What I'd keep for myself would be teleportation ability. I always say I love to travel, but that's not entirely truthful. What I like is being other places---traveling there, not so much. I'd also like to be able to teleport objects, like food from Feed My Starving Children, directly to orphanages and poverty stricken areas, bypassing hefty freight charges and corrupt governments. KAPOW! Winter Sky believes she is everything ordinary . . .until she is kissed by Alex Stormhold. As seer of Stormhold Coven, Alex is sworn to be Winter’s protector against the darkness that hunts her. Violently thrust into a magical realm she always thought impossible, she stumbles upon a disturbing secret of her own. 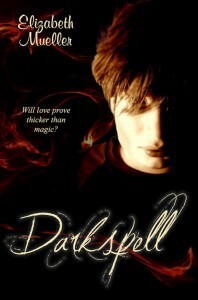 Will love prove thicker than magic? I'm wishing Elizabeth's and her book all the best! Ha, Meyer has quite a few things wrong. I wish the woman the best of luck. She needs it! I can't get my head around the concept of sparkly vampires. i love it when the vampire gets it in the end! I loved your 100 word spooky story! At first I thought you were posting an excerpt from a book out there. You should turn this into a full-length novel!!!! Thank you for the shout out, Nicki! That was just crazy girl! Sent shivers up my spine. Wishing Elizabeth all kinds of success with her book. Hi! I'm popping over from Theresa's blog. I was wondering why Edward sparkled in the sunlight too; I also wondered why the Cullen's house had such big windows. Wouldn't they want to keep them covered up? Or perhaps they like to sparkle? Great idea! I'd love to join your Order of the Phoenix. You have some great ideas Nicki. Mueller's book is very inspiring, it sounds like a fantastic read, congratulations to her.